Vikings Kickoff Event Tickets on Sale Now! 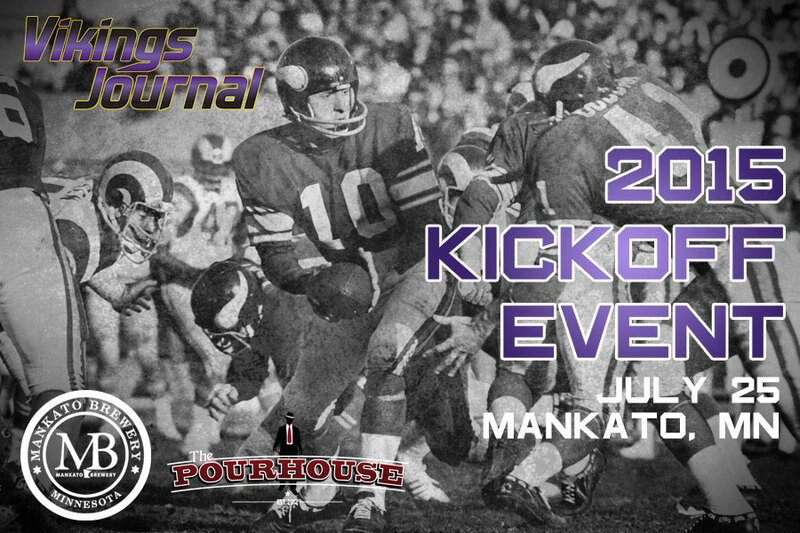 Tickets are now on sale for the 2015 Vikings Journal Kickoff Party at the Mankato Brewery on July 25. The cost is just $5 and will include one Mankato Brewery beer, a Vikings Journal pint glass and a Q&A session with the Vikings Journal writers. If you’re going to be in Mankato for the start of Vikings training camp on July 25, why not get a ticket and join us? The players are only moving into the dorms that day so you won’t get to see them on the field anyway. The first practice of camp is on Sunday, July 26. The Mankato Brewery is located at 1119 Center St. in North Mankato. For those of you who want to try to win FREE tickets and a VIP Experience for the event, we’re also holding a contest to give away tickets! 1. Why will the Vikings make the playoffs this year? 2. Who is the greatest Vikings player of all-time? 3. What was the greatest Vikings team of all-time? 4. Which Vikings player are you most looking forward to watching in Mankato? Contest submissions must be posted to VikingsJournal.com by Saturday, July 18. The Vikings Journal staff will then choose the winners on July 19. Yes, more than one person can win so get started on those blog posts! Staff members of the Vikings Journal/Twins Daily/Wild Xtra/Northern Pitch family of websites will also be on the party bus so you’ll have plenty of beer-drinking buddies with whom to party. Have you seen that party bus?!? Gather your friends, spread the word on Facebook, SUBMIT A BLOG POST and make plans to join us in Mankato! → Article: Vikings Kickoff Event Tickets on Sale Now!